We arrived in Asheville late Friday evening, and went on a little adventure to find our hotel. Scott is incredibly good at following Teri even when the directions are not clear and there’s lots of almost-turning, only to go straight after all. We slept the night away, and in the morning enjoyed “the best hotel breakfast in Asheville” (according to the sign in the hotel lobby!). 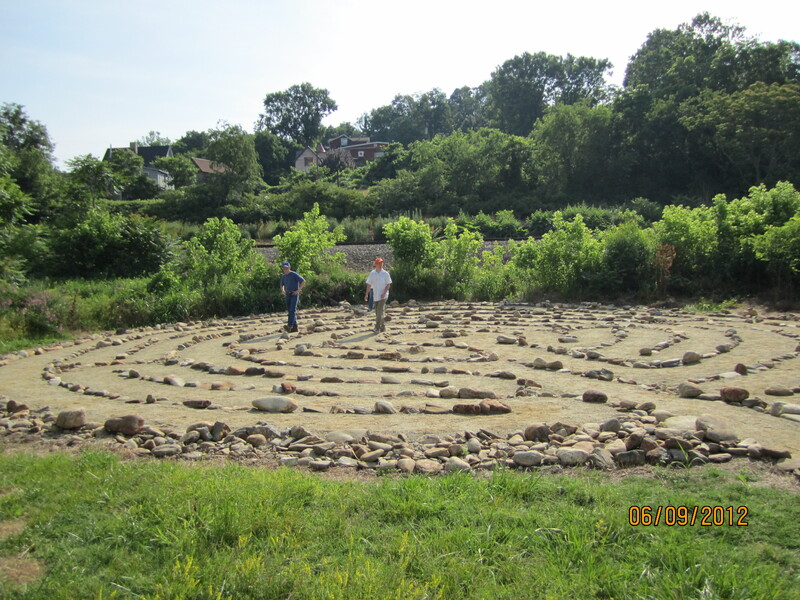 Then it was off to dedicate our week to God by walking a beautiful outdoor labyrinth in the River Arts district of Asheville. When we’d finished our prayer walk and sung “We Walk His Way,” we headed out to Asheville GreenWorks for a day of serious labor. After hearing about all the different invasive plant species in the area, and being warned about snakes and spiders and ticks (oh my! ), we headed into what will eventually be a beautiful greenway along the Buttermilk and Hominy creeks (which feed into the French Broad River). Of course, it’s not yet this beautiful park…one day it will have native ferns, green space, a gazebo…it’ll be an outdoor classroom, a community gathering area, a great park for the people of Asheville to enjoy the water and nature. 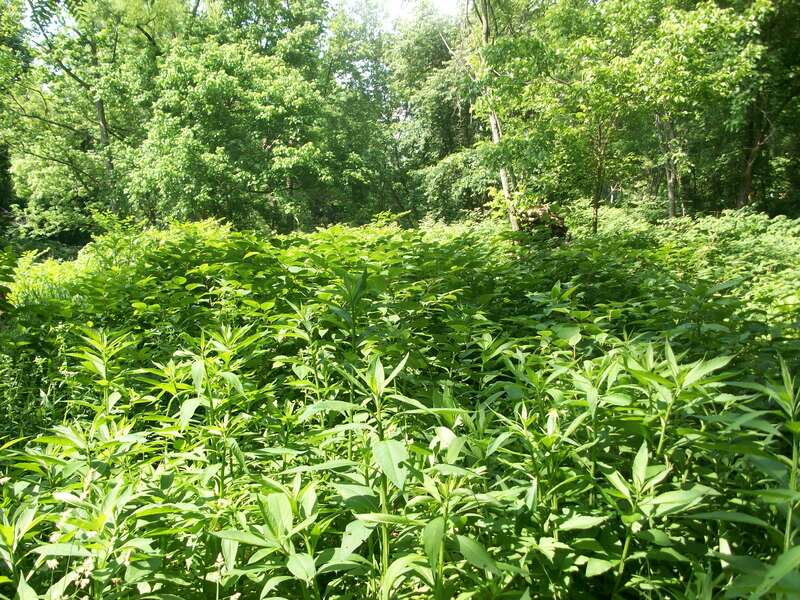 But right now it’s a tangle of 9 of the top 10 invasive plant species in the country. 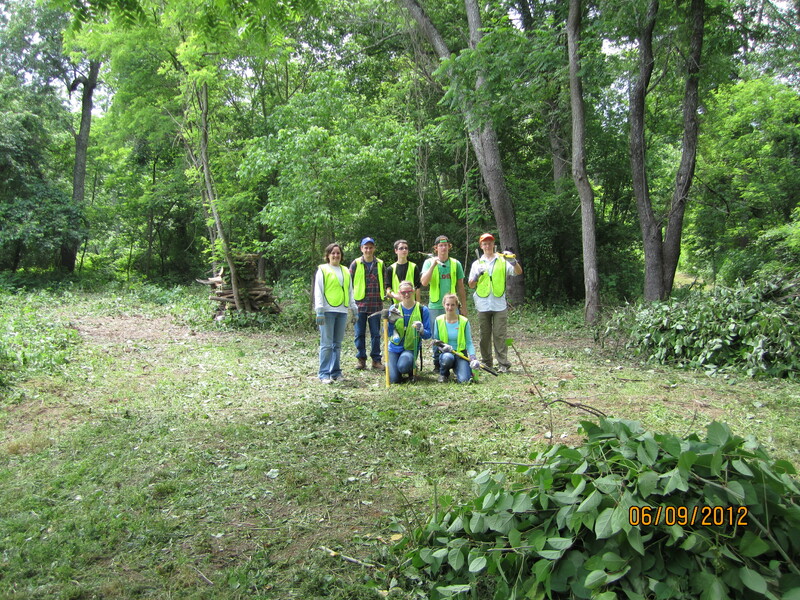 We hiked into the woods and got to work cutting down chest-high Japanese Knotweed and Multiflora Rose bushes. As we worked we talked with the various workers, volunteers, and interns of Asheville Greenworks and heard about their vision for education, recreation, and conservation. One of the families walking the trail stopped to thank us, and they asked “what did you do to have to do this?” and we realized that many people think about community service as a punishment rather than a privilege. So interesting. But we did enjoy the day of working hard, even if it was sometimes hot and dirty. At the end of a long hot day of work, we hopped into inner tubes and were the first ones to float down the newly cleaned up French Broad river this season, many thanks to the Asheville Outdoor Center for that opportunity. Excitements of the day: we got to use machetes! There are fireflies! 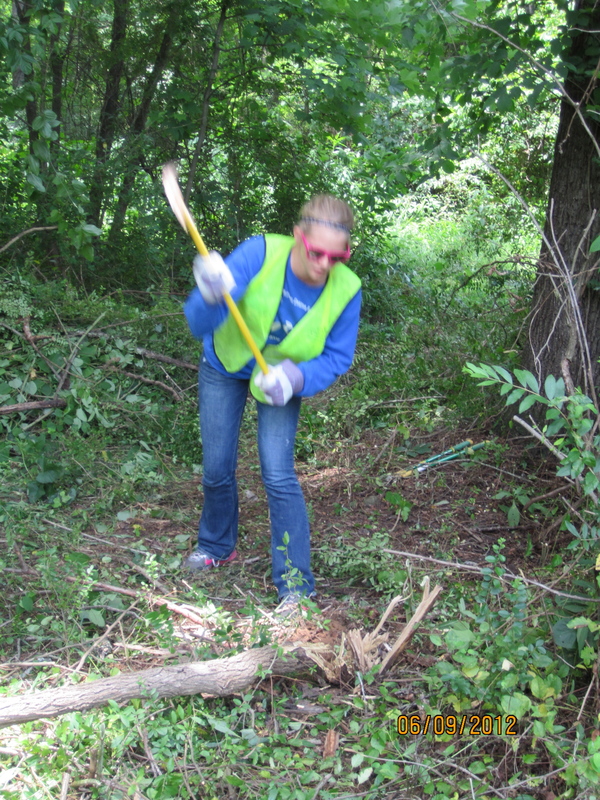 Hannah and Chris chopped down trees! 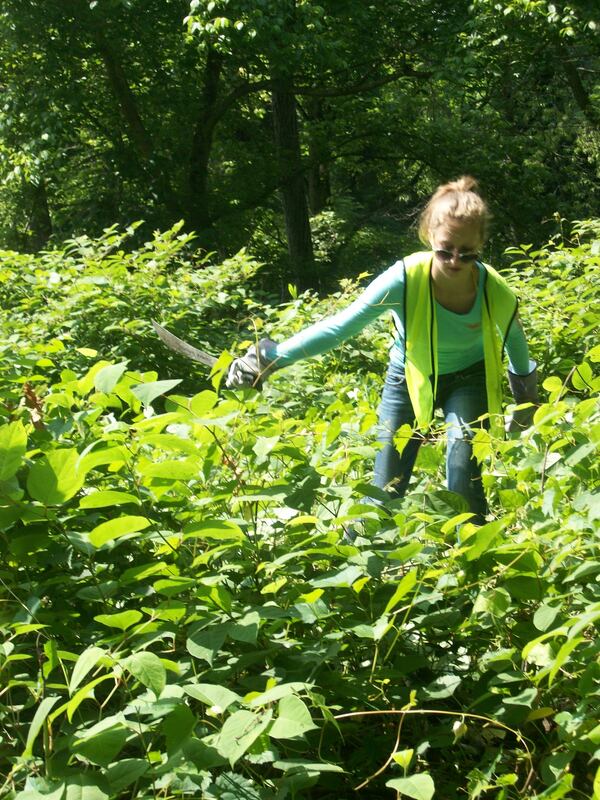 Things we learned today: that Japanese knotweed is incredibly invasive and strong and can grow 2 feet in a day. Also, poison ivy can’t even compete with the knotweed. Flamingos use echolocation to find their food (a tidbit from a Greenworks volunteer). Peanut butter, honey, and pretzel sandwiches are delicious. 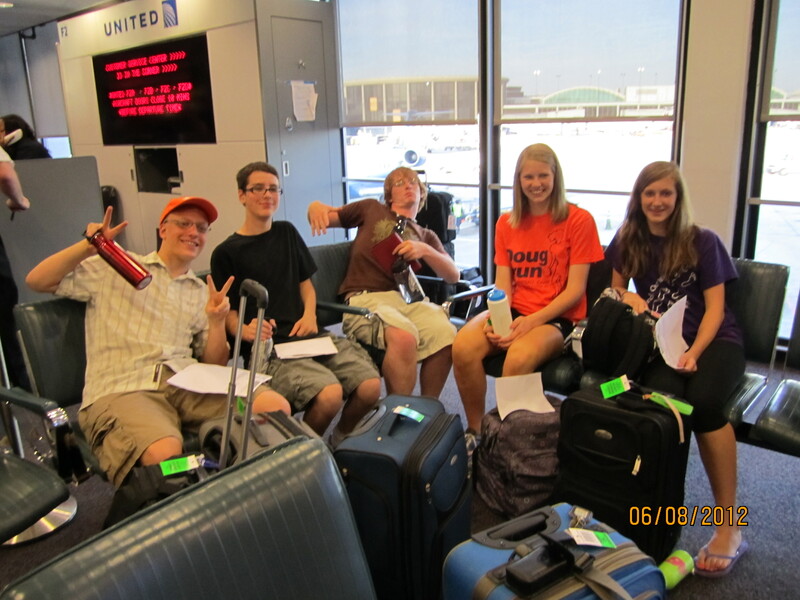 The staff and congregation of Ridgefield-Crystal Lake Presbyterian Church. 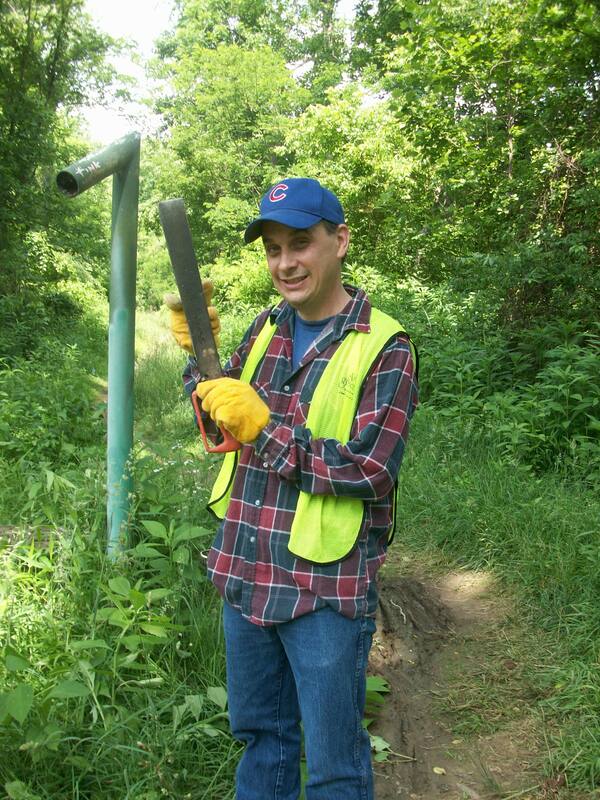 The weeds in my garden are getting pretty aggressive…I NEED a bedazzled machete!!! Maybe you ought to make some and auction them off for a fundraiser. I for one will pay top dollar. Invasive species are incredibly tragic things. I, for one, appreciate the effort you’ve made to beautify my native habitat. Growing up in North Carolina, there was a beautiful and extremely large magnolia tree in our front yard that eventually was taken over by kudzu, which was brought to the area to prevent erosion. So thank you for invading the invasive. What’s it take to become a sublime exduenpor of prose like yourself?